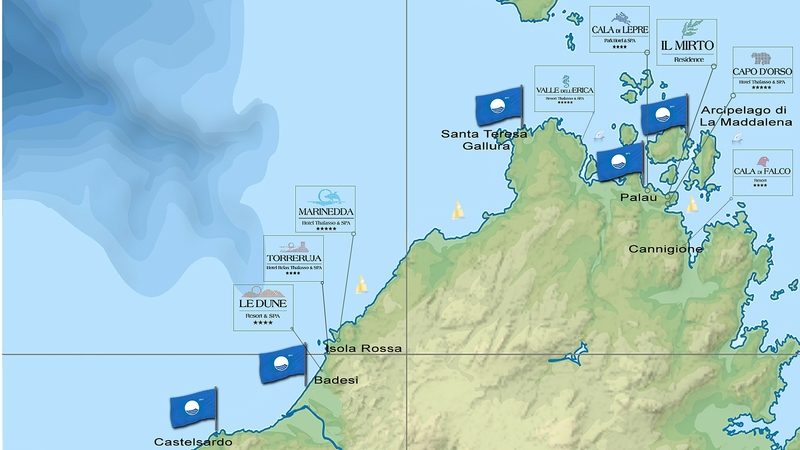 If you are looking for well-equipped beaches in Northern Sardinia with excellent quality water for swimming, managed according to environmental sustainability criteria and provided with hotel facilities, look for those beaches where the Bandiere Blu, or Blue Flags are flying. This is the official recognition given annually by the FEE (Foundation for Environmental Education) to those seaside resorts that have these characteristics. Five locations have achieved Blue Flag status in 2016 in Northern Sardinia: Badesi, Santa Teresa Gallura, Palau, La Maddalena – Caprera and Castelsardo. The FEE selection confirmed the 2015 Blue Flag beaches and placed Badesi with its Li Junchi beach in the special category. Li Junchi at Badesi, a new entry among the 2016 Blue Flags and the beach at the Resort Le Dune is an 8 kilometre long stretch of sand facing the Golfo dell’Asinara, perfect for spending holidays in Sardinia by the sea with the family and with friends; equipped with beach umbrellas and sun loungers, the Badesi beach is the ideal place for doing watersports: windsurfing , sailing courses (with free catamarans for guests at the Resort Le Dune) and great spots that make Li Junchi a surfing paradise in the North of Sardinia. The Badesi seafront is also rather special, featuring restaurants, snack bars, kiosks and typical market stalls. In short, this is a great place to keep in shape either jogging or cycling or simply relaxing at sunset with an aperitif. Near the Resort Le Dune, the delightful small town of Castelsardo has had its Blue Flag confirmed at the two beaches of Sacro Cuore –Ampurias and the Madonnina – Stella Maris. Moving East we find the blue flag waving at Santa Teresa Gallura with 3 heavenly beaches a stone’s throw from the town centre and just a few minutes from the Resort Valle dell’Erica . As well as the Rena Bianca and Rena di Ponente beaches, the 2016 award also goes to Zia Culumba – Rena di Levante, at Capo Testa. The 4 beaches awarded the Blue Flag in Palau in 2015 are confirmed once more: just a few minutes from the Park Hotel Cala di Lepre you come to the beach at Palau Vecchio in the town itself, the famous La Sciumara beach and the larger Liscia beach. 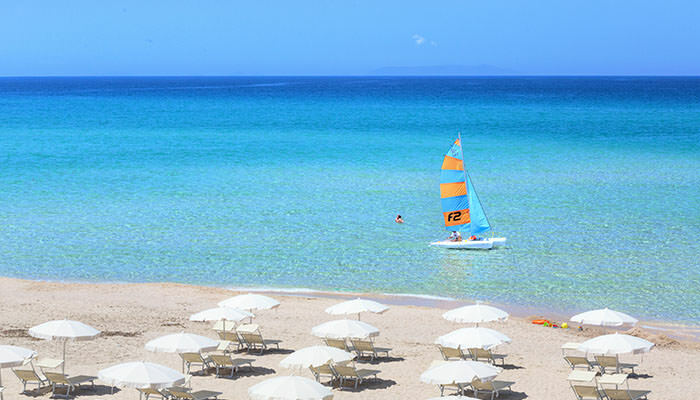 For younger and more energetic visitors, the Isuledda –Porto Pollo beach is the fourth winner in 2016. In addition to the beaches, the Palau marina also wins the “2016 Blue Flag marina” award. Finally we come to the famous beaches of the La Maddalena Archipelago National Park. Accessible in just a few minutes by boat from the Hotel Capo d’Orso and the Resort Cala di Falco, there are four beaches officially recognized by FAE: the Spalmatore and Cala Lunga beaches on the island of La Maddalena and the Due Mari and Relitto beaches on the nearby island of Caprera. The island of La Maddalena also wins a 2016 award for the Cala Gavetta marina.